Thanks to historians of that movement, and especially to Sandy Flitterman-Lewis’s study of Varda in her book To Desire Differently, Varda’s role as a pioneer—if not the “mother” or “grandmother”—of the new wave is now better known, and not just for the fact that she was the only woman director in it. 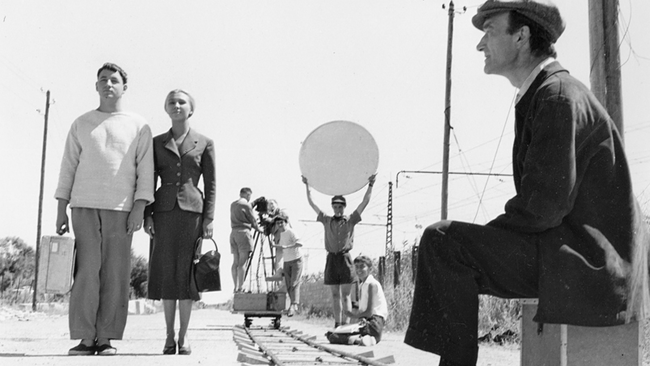 The production of La Pointe Courte by Varda’s own tiny company, Ciné-Tamaris, completely outside the film industry and on a budget a tenth the size of that of the average French film (the money came mostly from a family inheritance and loans from friends; she had no professional training and would not get an official French film industry membership card until much later), Varda’s authorial control over both scriptwriting and directing, the exclusive use of location shooting, the mixing of professional and nonprofessional actors—all of this was groundbreaking in early 1950s France. For these reasons and others, La Pointe Courte was a precursor of the films that Claude Chabrol, François Truffaut, and Jean-Luc Godard would start making five years later, and of those of Alain Resnais, who worked as editor on Varda’s film and whose generosity in that capacity and as a mentor she has gratefully acknowledged. Seeing La Pointe Courte again in 2007, after Varda’s extraordinary documentary The Gleaners and I (2000), also confirms how prophetic this first feature was, heralding—beyond the new wave—some of the most exciting developments in French postwar cinema, as well as in Varda’s own career. She would go on to make numerous documentaries and feature films, including the groundbreaking Cléo from 5 to 7 in 1961 and Vagabond in 1985. Back in the early 1950s, after studying philosophy and art in Paris, and working as a photographer, the young Varda decided to make a film set in la Pointe Courte. The area is a neighborhood of Sète, a city located in an unusual, marshy region between sea and lagoon—the étang de Thau—on the western Mediterranean coast. The story was simple: a young Parisian couple spend a few days in la Pointe Courte (where the husband grew up) in order to decide whether to stay together or not. Varda knew the area well—she lived in Sète in her adolescence—and this autobiographical dimension is another aspect of the film that places it within the new-wave ethos. But even beyond this personal involvement and the conditions of the film’s production, La Pointe Courte anticipates the new wave in its dialectical meshing of documentary and fiction, of neorealist aesthetics and high culture. On the documentary side is the overwhelming presence of the neighborhood, its inhabitants (whom Varda also credits for the script), its everyday life and rituals. On the high-culture side are the actors who play the central couple, Silvia Monfort and Philippe Noiret. Both were then with the prestigious Théâtre national populaire, where Varda worked as a photographer, and their performances bear signs of this milieu: they declaim their lines in a cryptic, detached fashion that deliberately contrasts with the villagers’ ordinary and accented speech. Accusations of stilted acting made at the time are misplaced, as Varda explicitly asked them “not to act or express feelings” and “to say their dialogue as if they were reading it.” (Moreover, because of her low budget, Varda had to shoot the film silent, and all voices were postsynchronized, the villagers dubbed by southern actors, which, Varda reports, annoyed them. She retained a good relationship with them, however, and has shown the film to the locals every ten years since its making.) Linking the two disparate worlds is a complex narrative structure that, as Flitterman-Lewis discusses, was borrowed from William Faulkner’s The Wild Palms. The materiality of the existential world of la Pointe Courte is present right from the credits, shot over the close-up grain of a piece of wood—revealed to be a section of a tree trunk when the camera moves away in a long tracking shot that leads us into the village. There follow several forward and lateral tracking shots (prefiguring Varda’s Vagabond) of the windswept, straight streets of the neighborhood and its low-lying fishing houses and shacks. One can almost feel the wind, the mistral that howls up the Mediterranean coast, making the washing dance frenetically on the line. The camera pauses to show the interior of a house where a woman feeds her many children, starting a theme that will run through the film. Varda documents these people’s lives, their eating, gossiping, quarreling, courting, working, seemingly at random, although she subtly weaves in several narrative threads. In particular we follow a young man, Raphaël, in his troubled relationship with fishing inspectors and the police, and in his courtship of Anna, initially prohibited by her father but eventually successful; we see them embrace in the last scene. Women gossip while hanging the washing, men repair the nets and go fishing in the lagoon, women and children help them pack the shellfish to be sold. Varda’s ethnographic approach is clearly prompted by her fascination with a place that seems to exist outside of time, a premodern space connected to contemporary France only by the railway line. While the fishermen’s activities cannot but recall Luchino Visconti’s La terra trema (1948), the amazing bric-a-brac in people’s backyards evokes Eugène Atget’s photographs of vanishing trades and habitats in late nineteenth-century Paris, pictures of which Varda the photographer would no doubt have been aware. The fishermen’s homes are poor, and in a heartbreaking (yet unsentimental) scene a sick boy, who later dies, is lying in a wooden box. The penultimate scene takes place at the joutes, an odd, popular local sport in which men decked out like Venetian gondoliers try to knock each other off their boats and into the water with long poles, as in a medieval tournament (now the joutes are a major tourist attraction). Yet Varda’s attitude is neither passéiste nor condescending. With respect and admiration, she charts the fishermen’s struggle with officialdom over environmental health issues. Her ethnographic gaze is also highly self-reflexive, another trait adopted by other new-wave filmmakers. In her book Varda par Agnès, she talks of how she was initially surprised that the villagers saw her as an “intellectual,” since she’d lived among them. Yet the film in several ways signals her cultural identity with the Parisian intelligentsia, and as a result her inevitable distance from what she is filming. The opening sequence introduces two health inspectors, seen poking around someone’s backyard and then roundly sent on their way by the garrulous Uncle Jules, a key local character. The health inspectors set up the introduction of the Noiret character as another, this time sympathetic, outsider, who, like Varda, grew up in the area; he waits for his wife at the railway station. Throughout the film, Varda emphasizes the couple’s estrangement from their surroundings. Their clothes, speech, and actorly aura already separate them from the villagers, but Varda also uses mise-en-scène to mark their “otherness,” frequently having them enter and exit the frame diagonally, as if to underline the fact that the village precedes them and will outlive them—culminating in the final dance sequence, where we see, from a high angle, the couple slice through the local dancing crowd on their way to the station. In striking compositions, Varda makes them pose against flat landscapes, glittering expanses of water, or unusual objects (a pole, a discarded basket, a disused boat). Anticipating Bergman’s Persona (1966), she sometimes films their faces in extreme close-up, at an angle to each other, and at one point Monfort speaks directly to the camera. The couple’s desultory exchanges on the fragility of love indeed seem trivial in comparison with the real-life dramas of the villagers. The couple’s problem is theater, the villagers’ real life. As one of the local women says, “They speak too much to be happy.” Yet La Pointe Courte blurs any facile dichotomy between “false” and “real.” The couple slowly respond to their surroundings, as in the end she decides to stay with him. Conversely, Varda turns the real locations into aesthetic compositions that stem from her training in art and photography. She delights in contrasts—between light and dark, wood and metal, life and death (fish and cats)—and parallels such as between the Parisian and the local young couples. Varda admits she based one scene in the film on the briefly glimpsed image of a woman’s hand against a white sheet while that woman was hanging out her washing. As in Cléo from 5 to 7, landscape and objects “speak” to the characters, and as in The Gleaners and I, Varda turns animals (cats in particular), wood, and everyday implements into so many artistic objets trouvés. In mixing a quasi-neorealist approach with high Parisian culture (photography, literature, drama), Varda, with La Pointe Courte, forged a new filmic aesthetic that would have major resonance in both her work and the rest of French cinema. Although its critical reception was mostly respectful, La Pointe Courte was not properly distributed, and Varda might have given up the cinema altogether if she had not been commissioned to make documentaries. She returned to fiction film only seven years later, with Cléo from 5 to 7. In the meantime, La Pointe Courte was obliterated by the tidal wave of Le beau Serge, Les cousins, The 400 Blows, Hiroshima mon amour, and Breathless. Yet it anticipated them all, and in retrospect its modernity is breathtaking. With hindsight, too, Varda’s unflinching yet compassionate look at the flotsam and jetsam of the contemporary world in The Gleaners and I follows in a direct line from her very first foray into cinematic experimentation, and her 2006 art installation L’île et elle, about the island of Noirmoutiers, shows the perennial importance of the seaside in her life and work. In many ways, then, La Pointe Courte was a rich matrix for Varda’s work to come. But she was right to claim no prior influence: when she made it in 1954 it was truly unique, and it remains so today. Ginette Vincendeau is a film studies professor at King’s College London. She regularly writes on French cinema in Sight & Sound. Her most recent books are Stars and Stardom in French Cinema, Jean-Pierre Melville: An American in Paris, and La haine.